It was cold when we left the city, and even colder when we pulled up to Heather Lake trailhead for our New Year’s Eve adventure. 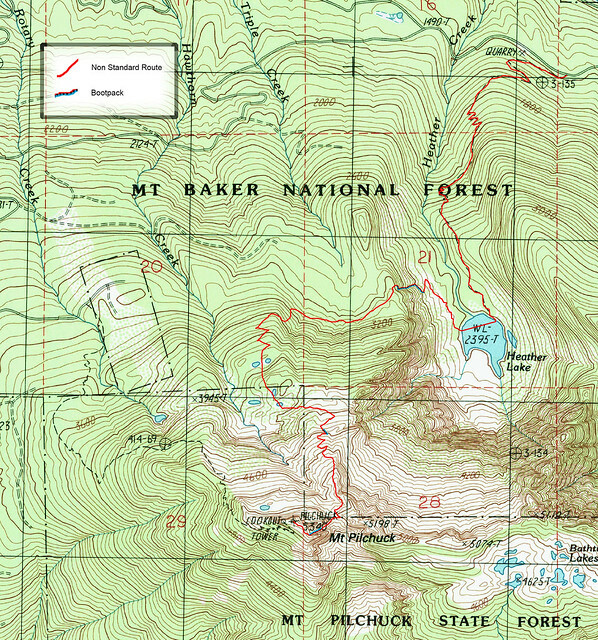 The goal: summit Mount Pilchuck via the non-standard northeast route. The day started off with driving decisions. The gate blocking the road up to Mount Pilchuck trail head was still open (it is now closed), but the road looked ugly and caused us to turn around quickly. If you had a pickup or jeep with clearance you would have a shot. 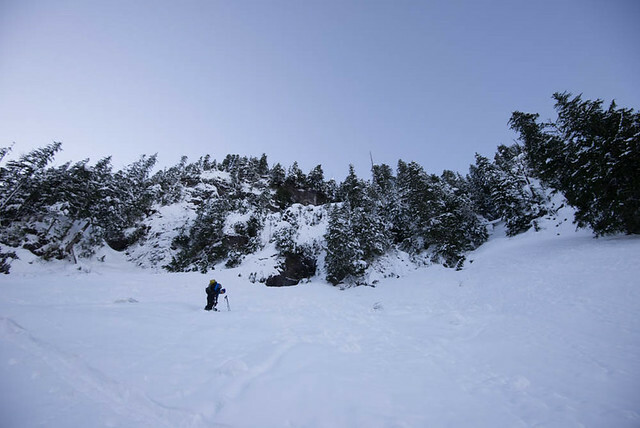 So we parked at the Heather Lake lot and started skinning up the established hiking path around 9AM. We immediately ran into an issue. 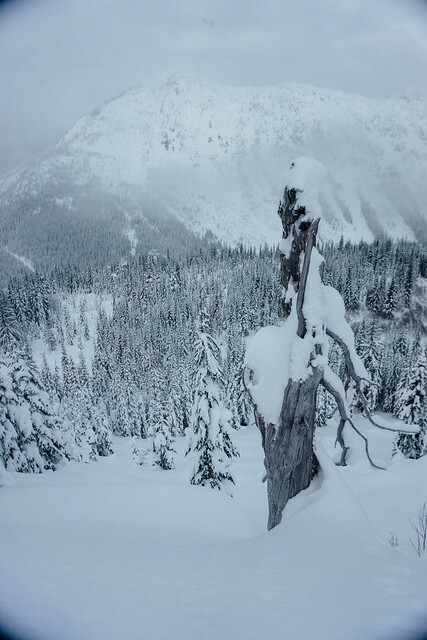 There were large trees that had come down, blocking the trail and making it excessively difficult to travel on skis. I had earlier proclaimed this would be the trip in which I would monitor my body temperature diligently and not sweat. Optimism is one of my quirks. The trees only lasted for 0.5 miles then the trail cleared up for easier travel. Within two hours we had reached our first objective, Heather Lake. At this point the trail ends and the route-finding begins. 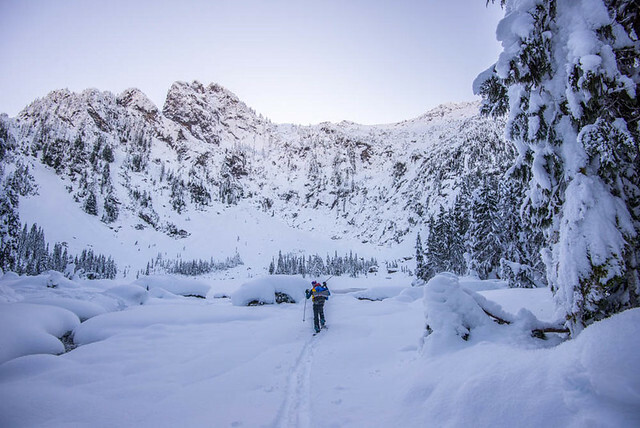 After considering Bob’s Couloir for a minute, we opted for a different couloir just to the northwest. It looked gentle enough. Soon though, we happened upon some cliffs and had to navigate up, through, and around. 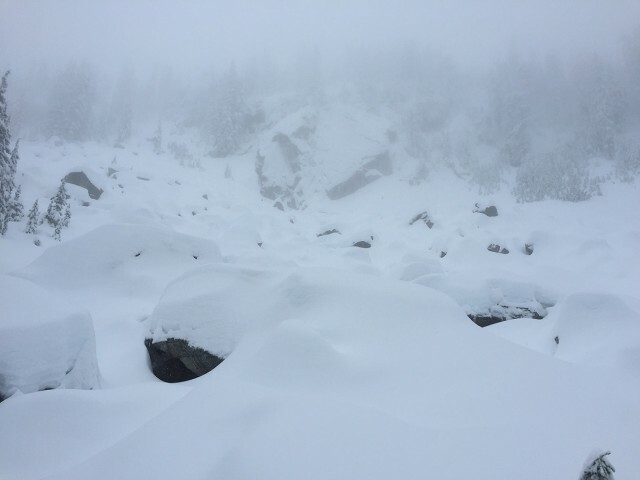 At this point, kicking steps took approximately 9-10 strikes each time because the snow kept sloughing off the cliff. This was very sketchy and not recommended in early season. 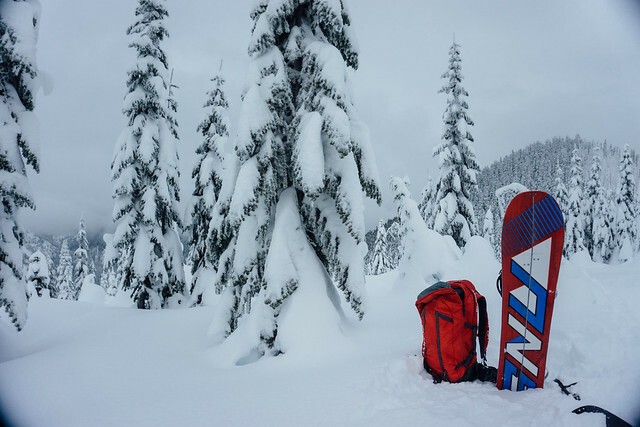 With another 2-3 feet of snowpack it would be a reasonable objective for a competent skier. After topping out on Never Not Stopping Couloir (we named it) and attaining the ridge, we ate food, boiled some water, and kept going. This next section was also interesting. 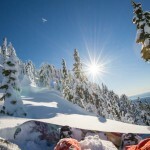 It was true north facing and had some deep snow and beautiful ski lines. Unfortunately we were still headed up and the beautiful ski lines made for difficult skinning. Also note there are many cliff bands in this section and the topo map likely needs to be updated. To get through it all, I recommend traversing west for 0.5 miles after the ridge and then heading up the mountain through some notches in the cliff band. You’ll have to maneuver a bit here but it goes. 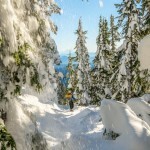 – Traversing through fields of pow! Soon we came upon the snow field, where we got our first views of the summit and the second party in our group who were heading up the standard route. 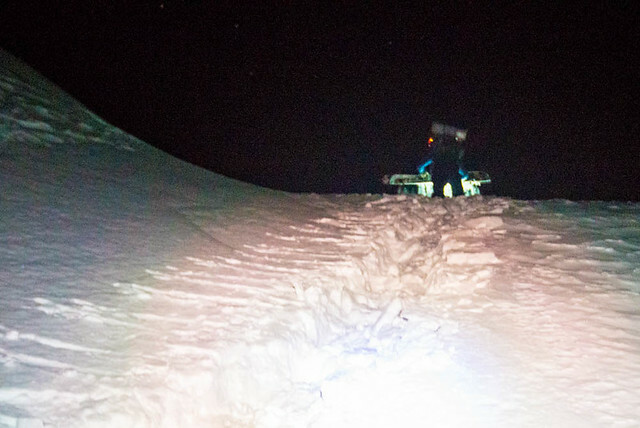 By this time we were about 8 hours in, it was dark, and we had to use headlamps as the moon had not yet risen. After eating and debating stopping, we kept going up the snowfield. 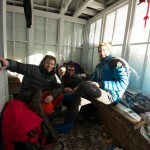 Travel was fairly simple as we found the ridge again and followed it up to the summit block. – Scott & Tiff killin it on the other side of the mountain. The final effort required traversing underneath the summit block and boot packing up Gunsight Couloir (east facing). It’s fairly steep, but the snow was good and it went smoothly. We topped out on the summit ridge at 10 PM. So if you’re doing the math it took us 13 hours up in total. I think we could have done it 2 hours quicker with more snow on Never Not Stopping Couloir and the subsequent snowfield. Nevertheless it is a long day. – Nerve endings on the toes took a bit of a beating on these boot packs. 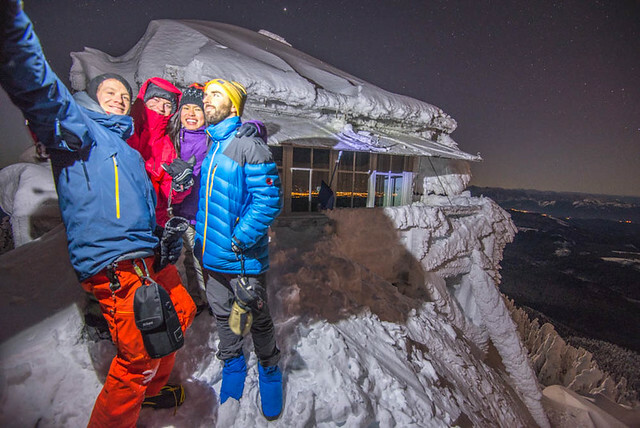 The best part of the climb, though, was our friends waiting for us at the fire lookout with smiles, christmas lights, adult beverages, and open spots on the floor to sleep. 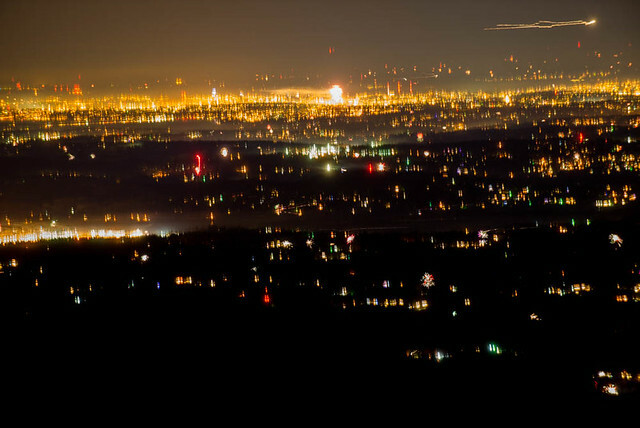 We watched the new years eve fireworks splash across western Washington at midnight which was a nice distraction from what was going on to the north east, Aurora Borealis was in full form behind us beaming up over Three Fingers and dancing across the sky towards Mt Baker. 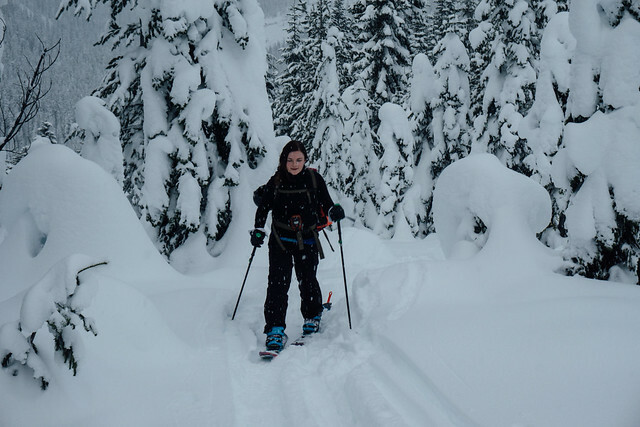 We descended via standard route the next day, which was mild skiing, but recommended if you are low on energy. I took my friend Mel up to the Yodelin area at Stevens Pass. 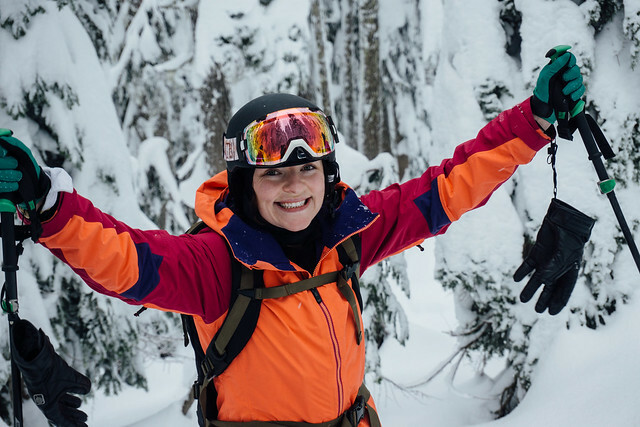 We’ve been getting hammered with snow in the Pacific Northwest this December and I wanted to get her into a zone with lower consequence considering it was her first time out on her splitboard. We got up to the nordic center around 9 am. The parking lot was about halfway full, but it seemed to be with only families sledding and wandering around the base area. We saw only 2 other touring groups throughout the day. The first group was two skiers skinning up about the same time as us. 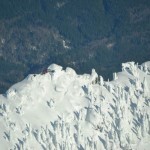 We saw one skier skinning up solo as we were leaving. I wouldn’t recommend riding solo based on the amount of tree wells in that area (I always ride with a partner). Yodelin appeared to have seen about 10-20 people touring the days prior based on the previous tracks. We were able to reap some great rewards. 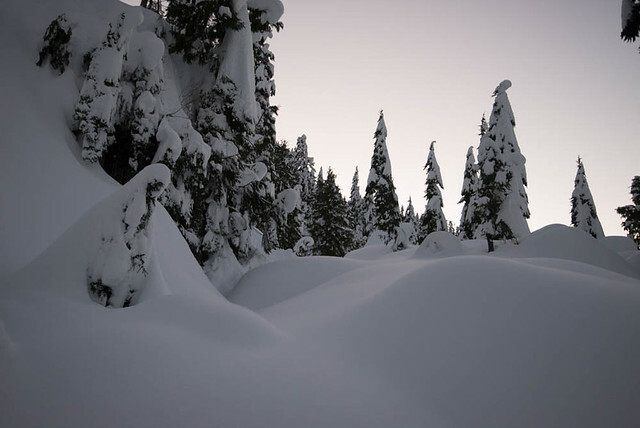 The snowpack felt very stable. We saw no slide activity in the area. My biggest concern with Yodelin would definitely be the tree wells. We saw and battled many that got very deep in areas. Keep your partner within viewable distance, which can be hard in the dense trees. We stopped after our first short lap to do some beacon training. It’s the first time I’ve done it this season, and I highly recommend everyone brushes up on this each year, or major trip. In every group people are of varying abilities and you always want to be sure you feel safe with your partner(s). 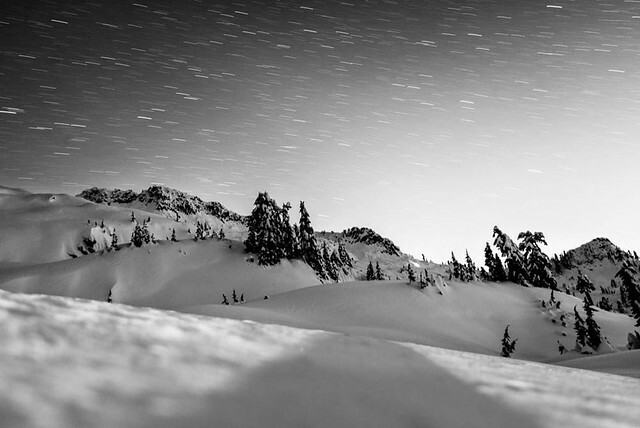 Happy trails and enjoy the deep snow we’ve been blessed with this season out west! Peaker Tim and I met in Ashford and headed up to Paradise for our powder meeting. With more than a foot of fresh snow forecasted, I was skeptical that the plowers would have the gate open on time so we opted for a lazy start time. Arriving to Paradise at 10am, we were surprised (and psyched) to only see about 15 other cars. From paradise we set out on the trail staying east of Alta Vista and eventually made our way to a place on Mazama Ridge that is labeled “Golden Gate” on the map. That label seemed a little out of place as we made our way up to the ridge. 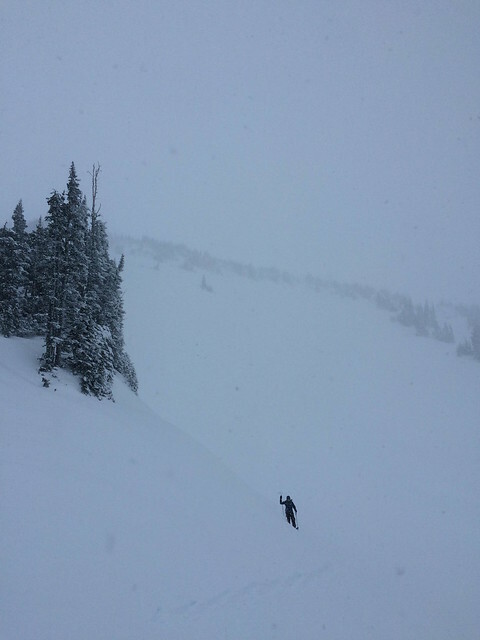 We were setting off small wind slabs and getting pounded with wind and snow. As long as we stayed off the wind loaded side of things the stability was good and the snow was even better – we’re definitely not in early season up high anymore. So, we skied down to ~5500 ft, took another lap, then went back to the car to dry. All in all a great day to welcome winter back! 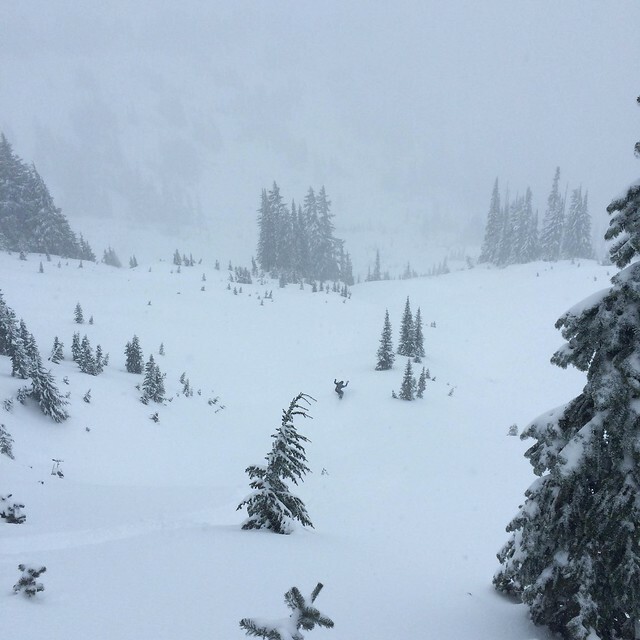 With the second storm in two weeks coming through the Cascades we took a quick trip up to Stevens Pass on Saturday for some winter analysis on the area. Tye Peak was the test subject and offered some shelter from the snowy weather which only got more severe as the day went on. 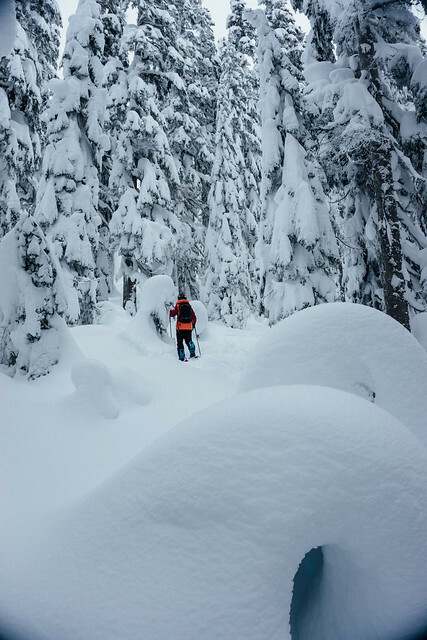 We started from the parking lot in about 6 inches of light fluffy snow that got deeper and deeper nearing Skyline Lake. The lake is frozen over, although we still opted to skin around it and then up to the ridge at about 5220 ft. Dropping off the other side down into the creek is still fairly exposed and if you trend left to stay higher up in the top of the basin you have to navigate some very big boulders. However we found if instead you ride straight off the ridge the turns are better, steeper and a lot better coverage. In this way you end up crossing the creek at about 4400 ft. Going up Tye Peak the stability above treeline was solid although with the increasing weather a storm slab was beginning to develop. There is about a foot and a half on top of the old snow from earlier this week but the rain seems to have removed any weak layers. 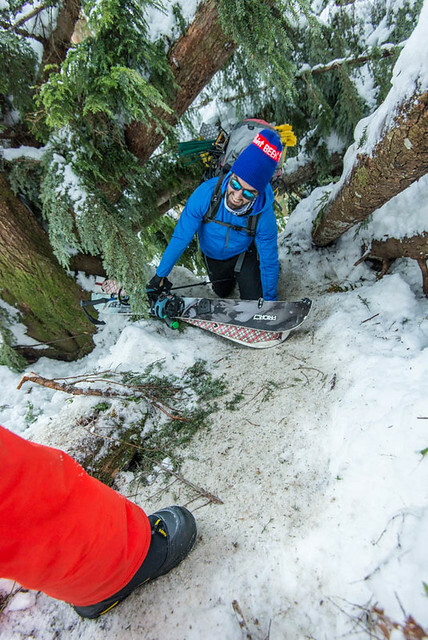 The turns were deep off of the top and no further testing was required. The results are in, winter is here!